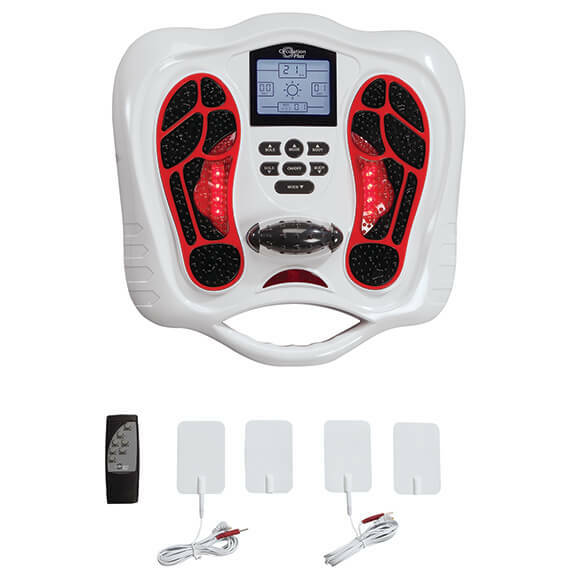 All-in-1 TENS unit and foot and leg massager helps boost healing circulation as you sit. Simply place feet on the massager and choose from a menu of modes and intensities, easily adjustable using the wireless remote. Tiny electrical waves stimulate nerves to help increase blood flow and reduce swelling and fatigue in feet and calves, while FAR infrared technology helps warm muscles. Built-in foot roller is perfect for soothing plantar fasciitis and heel pain, too. Deluxe set also includes 2 TENS wires and 4 pre-gelled electrode pads for use on hard-to-reach areas such as your shoulders, back, hips or anywhere you have tight, sore muscles. IT SEEMS LIKE THE BEST PRODUCT FOR HELPING OUT WITH MY TIRED LEGS AND FEET. I'm on my feet a lot and need comfort at the end of the day.